Erica Williams is a Washington DC-based activist who works to get under-represented communities to take part in the political process. 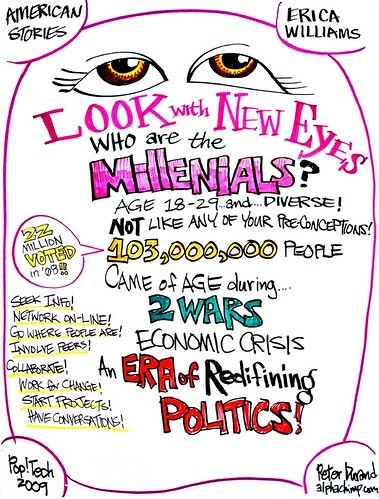 She asked the PopTech crowd to put aside any pre-conceived notions about her generation (the Millennials, born in 1978-2000). Williams was raised by two pastors and defines her childhood by two things:faith and church. When she was sixteen, her father was delivering a sermon entitled “New Life”, suffered a heart attack and died in an instant. This guided her decision find her personal calling and become involved with politics (even though she confesses she doesn’t really like what America calls “politics”). The Millennials, says Williams, in fact don’t relate to traditional politics. However, despite a lack of trust in political leaders, they are one of the most civically-active generations. Williams is interested in redefining politics to include more than a bumper sticker, a yard sign, or even voting. She’s helping to figure out what politics should look like in an ideal, collaborative, “post-racist” society. This generation is using the tools available to them (e.g. Internet, blogs, web forms) to research and organize. This is more powerful, explains Williams, and better addresses her generations unique needs and demographic. 22 million voters unders under the age of 30 voted in the Presidential campaign — this is how he got elected. The Milliennials supported Barack Obama because he supported them and their vision for what they want to achieve. Williams’ vision for America is about honesty, connectivity and collaboration. These shared ideals should be timeless and ageless. PopTech 2009: Erica Williams from PopTech on Vimeo.